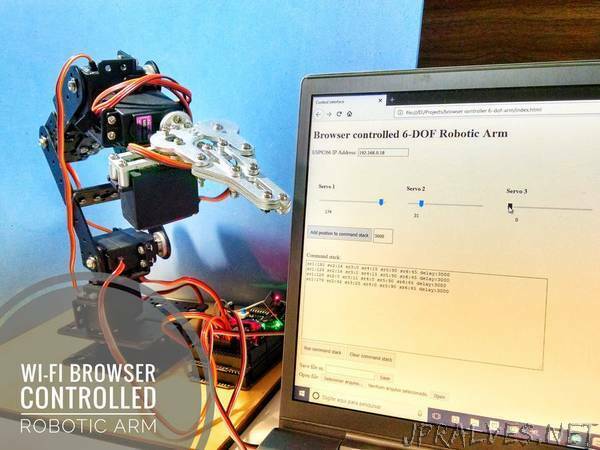 “Control your robotic arm remotelly using an ESP8266 WiFi module, from a simple html interface! There are several ways you can use this tutorial. If you don’t have a robotic arm kit (and doesn’t want to buy or build one) you can still use it to learn something about Arduino programming, and how to interface an Arduino with an ESP8266 module on your own projects. You can also use it to practice your electronics and mechanic skills.